Pepa Loves is a site which has been on my radar for a while now; with it's cute styles and quirky prints, it's right up my street. Here are some of my current favourites. 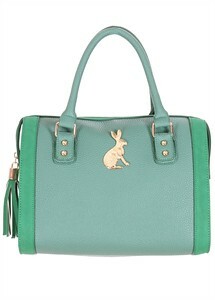 001: I love the colour of this bag, as well as of course, the rabbit charm on the front. It looks as though it would be the perfect size for keeping all of the essentials in and I think the tassel on the zip pull is super cute. 002: This Eiffel tower print dress is just fab. The print is really cute, as is the sailor style collar with the stripe details. 003: As with the other items, I think it's the details on this cat print top which make it for me. The scalloped edges on the sleeves and the cute Peter Pan collar. Combined with the bright and colourful cat print, I think it would be perfect with my red taffeta midi skirt. Have you shopped with Pepa Loves before? I've just placed my first order, and can't wait to share what I've bought. Love that cat print top! The details definitely make it. I've become a bit obsessed with scalloped edges recently. Think I need to incorporate some into my wardrobe. Yes, I was wondering about attempting some scallop edges to my next sleeves. I'm not sure how to do it. It's so cute, they seem to have a few different ones with rabbits on them. Aaaaaamazing sailor dress!!!! The cat top us cute too. I've not heard of the make!!! Aww, I'm not convinced that coat really looks any good on me either, but hey ho. I saw THE one in Leeds on Saturday and they do look so similar. It's lovely - I ordered some things and they arrived in a week, which i think is great from outside of the UK. What have you ordered? Can't wait to see. I love this cat print top - cats and collars are a pretty perfect combination. I'll post about them now that they've arrived -can't believe how quick they turned up! Totally missed a purrfect pun there! Never heard of it. Loooove that eiffel tower dress, the sailor style is so cute. They're super cute. And I ordered and they arrived in one week, which i think is really good from Europe!